I can’t have any say in what chassis my trucker uses. It’s your cargo, so you absolutely can have a say – if you choose to, and you have options, too. There are many different pricing structures that will give you more control over your dray via the chassis – from having the chassis provider bill you directly, to setting up a private pool for your truckers to pull from, to even leasing your own equipment on their behalf. It all depends on how you choose to manage that link of the supply chain. Poor chassis quality in pool environments can impact my delivery schedule. The prevailing belief is that pool chassis are low-quality pieces of equipment and, once upon a time, that statement was, for the most part, true. That’s why there has been a concerted effort by all of the IEPs to improve chassis quality across the pools. On our part, DCLI has converted over 20,000 of our pool chassis to radial tires and over 60,000 to LED lights. New equipment is also being added – over the last three years, DCLI has added over 6,000 brand-new chassis to our fleet and this trend toward equipment improvement continues today. Pool chassis are a major contributor in terminal inefficiency. Having access to pool chassis can significantly increase efficiency into and out of terminals when compared to sourcing equipment from off-site locations. The strategic access that on-terminal inventories deliver can eliminate unnecessary chassis splits and improve overall driver productivity. Pool equipment also allows for terminals to provide wheeled services. Pre-mounting containers can expedite a driver’s turn time through the entire container pick-up and return process. Pool chassis also increase the probability of street-turn success, allowing motor carriers to work together and seamlessly street-turn containers and chassis with each other in order to reduce the frequency of empty returns to the terminal, as well as the associated costs to the shippers. My ocean carrier won’t let me use my own chassis – it’s part of their package. While this statement is true for certain ocean carriers, some lines are very open to negotiating the terms of the freight agreement with their shippers. If unbundling your supply chain is something that you are interested in doing, you can seek out the ocean carriers that are more open to the terms they will negotiate. Remember that if you don’t ask, the answer is always no, so you should feel confident in having the discussion with any ocean carrier that is involved in your supply chain. Mega ships will continue to constrain resources at ports and rails. Concentrated volume will always impact port operations, and larger and larger ships make for higher and higher volume concentration. Understanding the stress that this industry trend will place on inland delivery networks, partnering directly with a chassis provider is a key differentiator that will allow you to improve the likelihood of success on the first or last mile of an international shipment. Chassis providers have historically operated off of macro-level forecasts provided by ocean carriers, rails, and ports, who communicate total import/export demand. By partnering directly with a company like DCLI, these critical pieces of information can be used to improve service for your cargo. Shippers who have taken advantage of this type of relationship can provide their chassis partner with insights into empties on yard, daily dispatch plans, anticipated imbalances in their current demand versus what is already in the control of their motor carrier, and seasonal surges unique to their supply chains. This visibility means that unique intermodal equipment solutions can be designed to ensure your products are delivered on time. 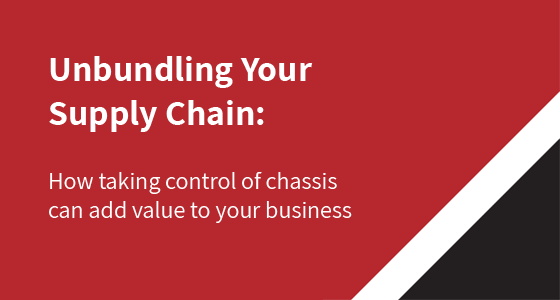 Interested in learning more about your options when it comes to unbundling your supply chain and taking control of your chassis?